When I first started practicing yoga, back in 1999, I had no idea what to expect. I wanted to relax from my stressful job and improve my posture. I wouldn’t say yoga gave me a great epiphany, there wasn’t a lightening bolt moment of revelation, but over time I became aware that I was more and more fit, healthy, happy and connected. All little things which have gone a long way to make me feel better and brighter. 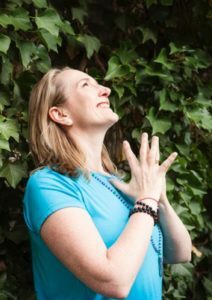 In 2005, I found myself longing to share these benefits, and enthusiastically threw myself into teacher training, which continues to this day as I develop my own practice and share my love with those who come to practice with me. As a mum of two girls, sometimes my feet don’t touch the ground – life can be busy and stressful but being on my mat helps me feel grounded even when I’m serving my kids as an unpaid taxi driver. I hope to offer the same things to my students. We all come to yoga for totally different reasons, all of which are great and completely valid. There is a place in yoga for everyone and always a space to grow into. So wherever you are now, yoga will meet you there and open up a new world to you. I’m passionate about building community. I aim to create a safe space where you can come and be. Where you can move, breathe, connect to your inner beauty and then move back out into the world, feeling better and brighter than before. I love to offer my talents to all level of students, including teachers and trainee teachers. I’m dedicated to providing further training for yoga teachers – if you are a teacher looking to elevate your teachings or refine your skills then take a look at my CPD page.